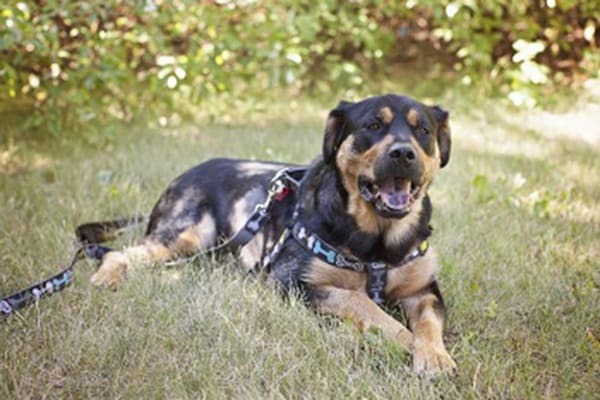 Humphrey is a lovely Rottweiler mix who came to us from the Winnipeg Humane Society for medical reasons May 2015. Humphrey was treated for heartworm in December of 2014 and has recovered nicely. Humphrey also makes a lot of noise when he exercises so he needed to be assessed. July 10, 2015: Humphrey was assessed by the specialists at the Veterinary Medical Centre and it was determined that he has laryngeal paralysis. At this time surgery was not recommended which is really good news! He has another check up Sept 25th to make sure that he is doing well! At that time he will also have a dental to remove a cracked tooth! laryngeal paralysis, he’s not supposed to over exert himself. Lucky for us, Humphrey is a smart boy and has pretty much figured that out. 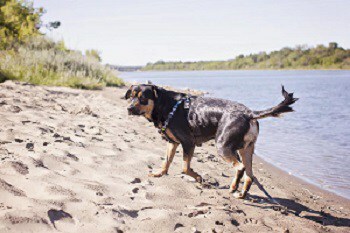 He still enjoys all the things that normal dogs do including going to the beach for a swim!! His foster home loved him so much they adopted him! You can make sure that we can continue to help dogs like Humphrey by making a donation to our Guardians of Hope fund!